Give a minion +2/+4 and Spell Damage +1. 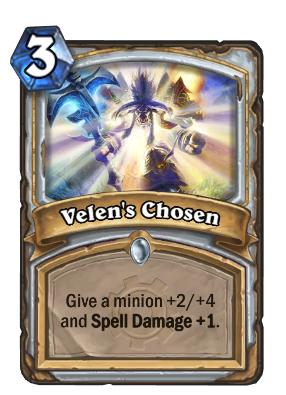 Velen wrote a "Lovely Card" for Tyrande with a picture of the Deeprun Tram that said "I Choo-Choo-Choose you!" Crafted this and Deathlord just to complete LoE heroic. Maybe I'll try this in wild. Thank God this can't be used in standard. Why exactly is a Tauren supposed to be the chosen of Prophet Velen? Wouldn't it make more sense for the art to be something like a Draenei or even a picture of Anduin. Mark of Nature looks even worse compared to this, especially since the Priest's hero power synergizes with health buffs better. Though that's reason to buff the former in my opinion, not to nerf this. I am happy that this card is going out. With coin its either a 3/7 cleric on turn 2 or 4/12 deathlord on turn 3. Without drawing proper answers, how am I suppose to deal with it? I like the concept of this card but for a game like hearthstone it just isn't overly amazing. Playing it on turn 3 assumes your creatures survived, which is rare against smart opponents, but if it works you basically win. Anything outside of that is just too slow and vulnerable to silence. Dr Boom is better t7 than shredder + velens. I completely disagree. Playing it on the right creature will win you the game almost indefinitely. Playing this card turn 4 on a Deathlord will either force a silence or win you the game as priest. Hex Deathlord or Hex Sylvanas Windrunner / Ragnaros the Firelord. Removing a premium-removal from an enemy at an early stage is actually quite a huge deal. I love use this card with [card]Wild Pyromancer[/card]. I don't understand why people always act like Spell Damage is wasted on Priests. Sure, they might not be Mages, but they still have core/viable spells and combos that benefit from it. PS: Even if you ignore the Spell Power it'll still give a minion +2/+4, a total of 6 stats, for 3 mana. If I recall, the reason +spellpower isn't heavily found in Priest decks is because healing is NOT affected by spellpower, only damage. CoH only heals for 4, no matter how much spellpower you have. I COULD be misremembering/mistaken, but I do know that Holy Night and Holy Fire did NOT work in a spellpower build I tried out for H Grob. But she will have 9 life after velen's? And I don't know why you guys call it spellpower (this isn't world of warcraft), it's spell damage so obviously it doesn't increase healing. Healing cards are affected by the spell damage only if you have Auchenai Soulpriest on the board, read "if they actually deal damage". That's why they even renamed this mechanic from Spellpower to Spell Damage. This card would've been so much better if healing in HS worked with spell damage. Build your own Pillarfield Ox. Turn 1 Northshire Cleric, turn 2 Coin + Velen's Chosen. MUAHA, a 3/7 spell power & card drawing MACHINE!! That is beautiful, i've done it many times in arena its a sick way to start.